On October 23, CEGA welcomed it’s inaugural class of current visiting scholars — Proloy Barua from BRAC in Uganda, Narayan Das from BRAC in Bangladesh, Constantine Manda with the Ifakara Health Institute in Tanzania, and Fitsum Mulugeta from the Ethiopian Economics Association — to the University. 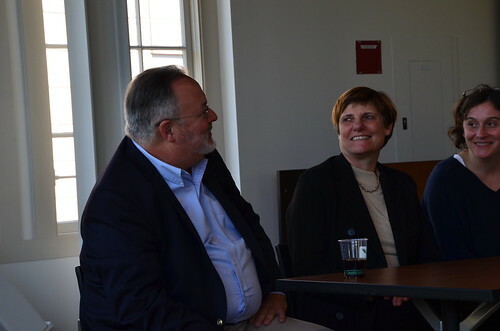 Dean Carla Hesse and Dean Keith Gilless both welcomed the scholars to campus and discussed the rich opportunities available to them. Each scholar then spoke about the impact evaluation studies they are designing in partnership with CEGA researchers, and the connections made between the Berkeley community and their respective research institutions. At the conclusion of the program, CEGA affiliates and other members of the Berkeley community had the opportunity to discuss shared research interests with the scholars. Refreshments were served. The EASST Collaborative is establishing a network of economists in the region that will provide local leadership in impact evaluation, policy design, and media outreach. The BRAC-CEGA Learning Collaborative will enhance the capacity of the world’s largest NGO to carry out randomized and quasi-experimental evaluations of its own innovative programs. Both efforts, launched in 2012, promise to enrich and generate ideas, create new partnerships, and empower local voices in the coming years.